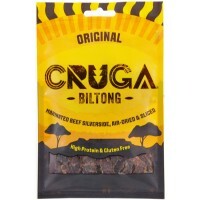 Get your protein fix the fast and delicious way- from Cruga! Cruga Original Beef Biltong features hand-selected strips of high quality beef, marinated in Cruga’s signature spice blend and dried to perfection, giving you the perfect portable snack! Perfect when paired with a cold beer and a walk in the woods! Beef, spirit vinegar, spices, hydrolysed soy protein, salt, yeast extract, caster sugar, colors E150c-E160c, preservative E202, acidity regulator E330. Contains GMO. Nutrition facts (for 100g): calories 274Kcal, total fat 4.5g (saturated fat 1.6g), total carbohydrate 3.2g (sugar 2.1g), protein 55.2g, salt 1.3g.